The import statements in Angular 2 can get pretty cumbersome if you're using a lot of services, models, directives etc in any specific component. Looking at the basic "QuickStart", the app.component.ts doesn't seem very obtuse. You can see how as additional parts of the application are adding to the import area, especially if a clean / readable code approach is taken. In a recent project, adding the Material Design 2 components caused what I call "import noise" so I used barrel to organize and reduce the impact. import noise - this is an issue seen in languages where there are dependencies that need to be "imported", "required", or "included" and the first (1 - n) lines are non functional code. 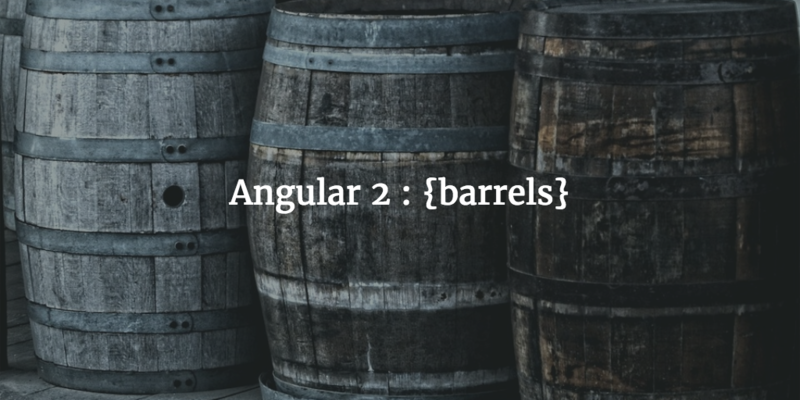 "A barrel is a way to rollup exports from several modules into a single convenience module. The barrel itself is a module file that re-exports selected exports of other modules." Simply take all of the related modules and move the import statements from the app.component.ts file and mark them as "export * from"
This takes the 12 lines to one really long line; which could be reduced further. That's pretty reduced! The * as md imports all of the modules and aliases as md. Depending on your editor, errors/warnings may show in the directives: portion of the component because it cannot find MD_SIDENAV_DIRECTIVES for instance. Fix is to add the alias -> md.MD_SIDENAV_DIRECTIVES to this and any of the material design dependencies being used. Using barrels will help make your code readable and maintainable. The Angular 2 source heavily uses these, browse through the code and you'll see this in places like @angular/core.